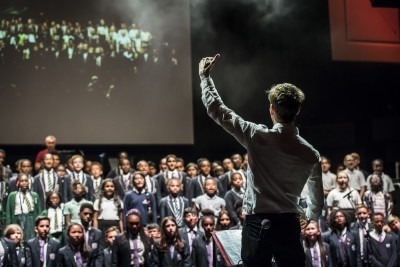 Newham Music is excited to launch Newham Harmony, a massive three-year singing programme in partnership with Stratford Circus Arts Centre and Living Song. From this autumn, we will host workshops and singing days in 30 Newham schools culminating in combined performances from the school choirs and the New Young Voices Collective (NewYVC) in a number of high-profile venues across London, including Newham Music’s annual Festival of Youth. Newham Music will engage more than 2000 children and young people in East London through a series of workshops over the course of the programme. Cluster Workshops will see neighbouring schools learning and singing together, and Junior Singing Days will include massed singing opportunities for the wider school communities within participating schools. The young people will be able to broaden their musical horizons and develop and nurture musical skills while working towards a nationally recognised Arts Award accreditation. Newham Music will deliver and support a comprehensive teacher training programme in participating schools, along with a formal Young Artist and Young Music Mentor Scheme. The teacher training will provide opportunities for music leaders in schools to develop and refresh their skills, while the Young Artists and Young Music Mentors will deliver a programme of support for young people to develop vocal workshop and choral leadership skills. This programme is made possible by generous funding from the National Foundation for Youth Music. For more information about Newham Harmony, or if your school would like to participate, please contact the Newham Music office at info@newham-music.org.uk.